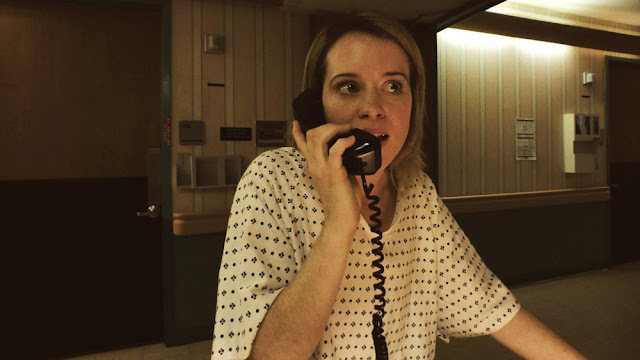 Now he's back with Unsane, a solid B-movie thriller shot entirely on iPhones. It's a technique that works well for a film centered on paranoia, insanity, and obsession, since these are all things our smart phones can easily exacerbate on a daily basis. Claire Foy (utilizing an American accent almost as grating as Kate Winslet's) stars as Sawyer Valentini, a single young woman who has recently relocated from Boston to Pennsylvania. She's started a new banking job, is doing her best to subtly ignore the not-so-subtle sexual harassment from her boss, and uses a dating app to hook up, insisting her dates will get what they want, as long as they promise to leave her alone forever after. She's got a past she can't seem to shake, the victim of a stalker (Joshua Leonard) she thought she'd left behind in Boston. When she starts to see him out of the corner of her eye, and in the form of one of her hook-ups, she begins to question her sanity, and figures it might be best to talk to a therapist about it. What follows is part Cuckoo's Nest, part Shock Corridor, after Sawyer signs the wrong documents and finds herself placed in "voluntary commitment" at a mental hospital where, of course, there's nothing that makes her seem crazier than her screaming that she isn't. It also doesn't help that she's convinced her stalker has followed her to the hospital, and is working under an assumed name. Trapped in the co-ed facility, she makes an enemy in the corn-rowed, shiv-carrying Violet (Juno Temple), and a friend in Nate (Jay Pharoah), an ex-junkie who seems to be as misplaced in the nuthouse as Sawyer believes she is. From the beginning Soderbergh uses his iPhone's camera to invoke a feeling of claustrophobia and voyeurism, with scenes of Sawyer that feel like they're being secretly filmed from a distance (which they actually were), and extreme close-ups that don't give any of the actors much breathing room. The lack of any traditional Hollywood glamour, in any aspect of the filming, from the make-up, to the clothing, to the casting, to the sets, gives everything a good feeling of reality, which is countered by our uncertainty over Sawyer's grasp of it. The low-budget technique also lends itself well to a story that hearkens back to the cheap exploitation films of the 1970's and 80's, when the issues of the day would be repackaged into metaphorical thrillers centered on things like drug use, assault, and revenge. Sawyer is every woman who has ever been gaslighted after reporting an assault, harassment, or even just apprehension over a guy's overly enthusiastic text messages, and Unsane is the ultimate "told you so."